When grief is loud, love cannot be silent. 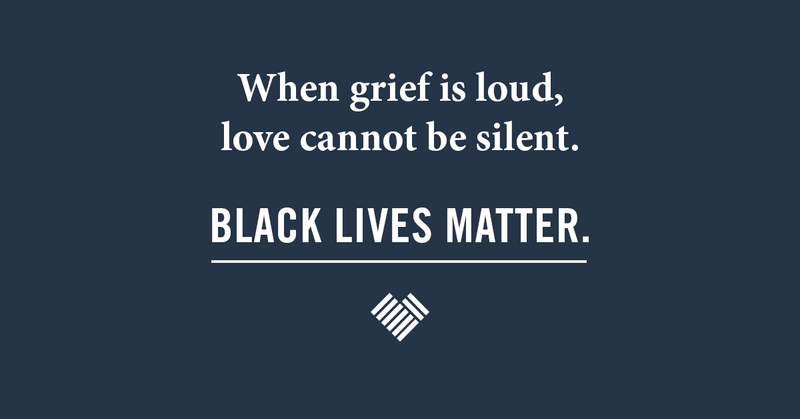 Our grief is loud today. We grieve the deaths of Alton Sterling and Philando Castile. We grieve the deaths of five slain officers in Dallas. There are days when it feels as if our collective grief can’t keep up with all the violence—when it feels like the world is being unmade before our eyes. A decade of living in a conflict zone has taught me this: at the heart of all this violence is fear. We fear loss—for some of us, we fear the loss of privilege, power, and control. Others fear the loss of their identity or even their very existence. We fear shame. We fear the ideologies, religions, and identities of those who are different from us—those we do not understand (or choose not to). We fear the other. Whether it’s a hijab-clad Muslim from the Middle East or a young adult black male from Minneapolis. Our fear leads us to fight—first with attitudes and words, then with fists, guns, and bombs. If we are to come together—a cliché used so often by politicians after events like these, it’s hard to know what it means anymore—if we are to overcome violence, then we must start by acknowledging and confronting our own fears. And then, having done so, we must walk toward whatever it is that scares us most—rejecting stereotypes, fears, and simple narratives; choosing instead to hear the narrative of the other; listening to the voice of the persecuted, the suffering, and those buried under the weight of systemic injustice; and, finally, acknowledging the unpleasant truth that many of us, including me, are beneficiaries of a system that is tilted in our favor. I am part of the problem. As a white male, I cannot deny my privilege. But I can choose to listen. I can choose to hear the lament, the cries, and the pain of my black friends. And having listened to those who are feeling scared and outraged, I can join them in their suffering. It’s not enough to use whatever platform I have to promote the rights and humanity of my Muslim friends in Iraq, themselves targets of stereotyping and marginalization—if I’m not also willing to promote the dignity and rights of my black friends in our American neighborhoods, cities, and states. Yes, “all lives matter.” But that’s not what needs to be said in this moment. As a white man, I’ve never been forced to defend the value or worth of my life. My inherent dignity has never been questioned in the way that my black friends experience every day. Preemptive love shines a light on those who are marginalized, dismissed, demonized, or oppressed, and it says your life matters. You are important. Your world is worth remaking.